With summer games for kids, you'll never hear your children complain that they are bored during their time off from school. Summer is a perfect time for play, especially outdoors. It's also a great time for the whole family to play together. These game ideas can fit a variety of different sizes of groups and are a terrific way to burn off the extra daylight during the summer months. 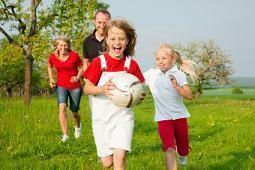 Relay races are perfect summer games for kids because they can be done with as few as four kids or as many as 20. Not only are relay races fun, but they help kids learn the concepts of teamwork and friendly competition. Laughs and the opportunity to burn off lots of energy are good side benefits. The classic egg and spoon relay is lots of fun for kids who are old enough to balance an egg in a spoon. You'll need hard-boiled eggs and large spoons (wooden or metal spoons will do). To start, divide the group into two even teams. Split those two teams into two separate groups. Group #1 will stand at one end of the playing area, and Group #2 will stand at the other. Give the first person in line on each team a spoon. Give those in Group #1 a hard boiled egg. Once the relay starts, the first person in Group #1's line will have to walk across the field to Group #2. When he or she gets there, the first person in Group #2's line will take the egg in his or her spoon and walk back across the field. While the kids are walking, the organizer can shout out instructions like "hop twice" or "walk like a robot". The kids have to carry the egg and try to do the action at the same time. Hide and seek encourages teamwork and also lets kids think creatively as they try to make hiding places out of everyday spots. It can be played as soon as a child is comfortable hiding by himself. For a variation on the classic hide and seek game, try out Sardines. In this game, the person who is "it" does the hiding. The rest of the group looks for the hiding person. Unlike the other game, when someone finds the hider, he joins him instead of revealing where the hider is. As more people find the group, they join in hiding as well. This leaves one person who is looking for everyone. Tag is a perennial favorite since it allows kids to run around and chase each other. Basic tag games are still very popular, but this new twist called "Octopus Tag" will have your kids and their friends playing for hours. Set up a rectangular playing field with four corner markers to create your "ocean." One player is selected as the Octopus, and the others are fish. The fish line up at one end of the ocean. The Octopus calls out "I'm the Octopus, king (or queen) or all motion, try if you dare to cross my ocean." All of the fish run from one end of the playing field to the other. The Octopus tries to tag the players running by without moving his or her feet. Any players who are tagged have to stop where they are and become seaweed. The seaweed become part of the Octopus's team and can tag other fish to become new seaweed. When the fish reach the other side, the Octopus and the seaweed call out the chant again, and the fish have to make another pass. The game continues until the all of the fish are seaweed. The last fish to be tagged becomes the new Octopus.